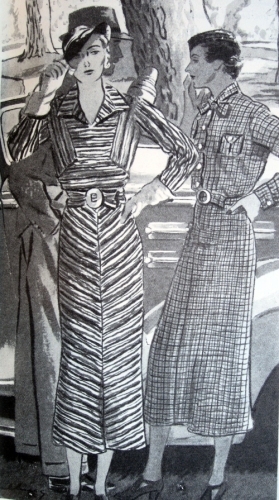 Three fashions for daytime, Delineator magazine, March 1929, page 29. They have characteristic dropped waists, a horizontal line across the hip, and hems that barely cover the knee. 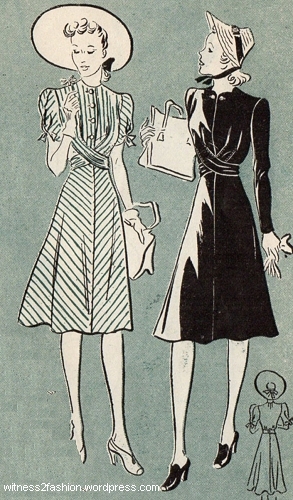 Fashions for daytime, Delineator magazine, January 1930. 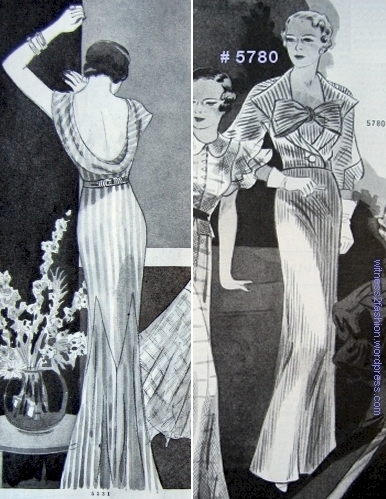 Butterick 3007 and 2984, on sale in January 1930, demonstrate the transition from 1920s to 1930s. It’s obvious that by January 1930, the change from the low-waisted, short-skirted 1920’s silhouette was already well under way. 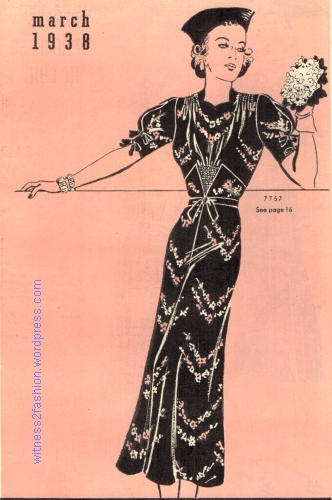 At a first glance, these suits do have a 1920’s look, but the return to the natural waistline and the move toward longer hems which they demonstrate is also illustrated on this catalog cover. Ad for Butterick Quarterly from Delineator, January 1930, p 76. It’s remarkable, when you consider the lead time for creating sewing patterns and for magazine publication: The design has to be approved, made into a prototype (muslin) and patterned, made up in fabric, modeled for the illustrators, “graded” up and down to a full range of sizes, and set into mass production before being issued and publicized in magazines, etc. This suit was not designed in January 1930, but several months earlier. 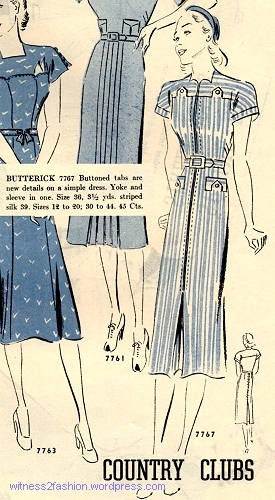 Butterick 2984 took months to develop and have ready for sale in January of 1930. 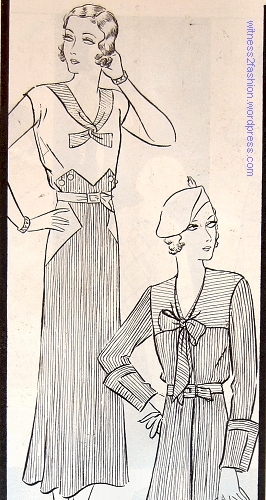 It looks very much like the popular cardigan-jacketed suit of the Twenties, complete with a long neck tie, but the skirt has a natural waist and a seam line at the familiar 1920’s hipline. The jacket is long, falling well past that old hip-level design line, and the skirt falls three or four inches below the knee. Butterick Quarterly cover, January 1930. 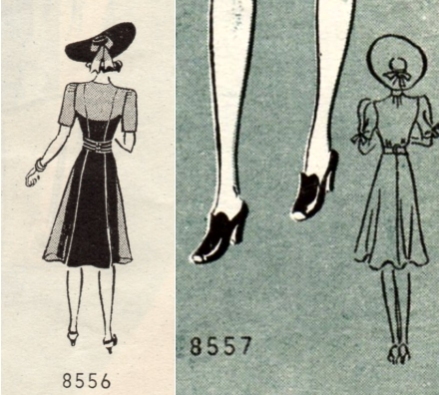 Suit 2984 is on the right, and is shown in a different illustration below..
Butterick 3007 (L) and 2984 (R) from January 1930. No. 3007 has a low hip seam and unstructured bodice that allows the wearer to put the belt where she likes. Two other observations: The three-quarter length coat was a popular 1930 option, and in 1930, a “sleeveless” dress really was sleeveless. I’ve been curious about the transition from 1920s to 1930s; apparently it happened very fast! 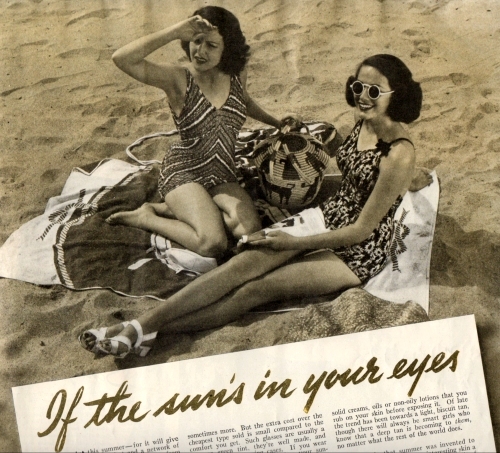 McCall’s coverage of summer fashions for 1938 included articles on choosing a flattering bathing suit — perhaps made of rubber — and the importance of wearing sunglasses. Full-page photo from McCall’s magazine, July 1938. Peach colored bathing suit and matching swim cap. McCall’s was a large format magazine, so I had to scan the top of the page, then the bottom and join them. This image was the “cover” of the style and beauty section, and didn’t have a description. Her waffle-weave swimsuit has a matching peach and white cap — or is it a scarf? There seems to be a tie peeking out from behind her head. Her coral lipstick and nail polish match. “If the Sun’s in Your Eyes” article, McCall’s, July 1983. Sunglasses and print bathing suits. 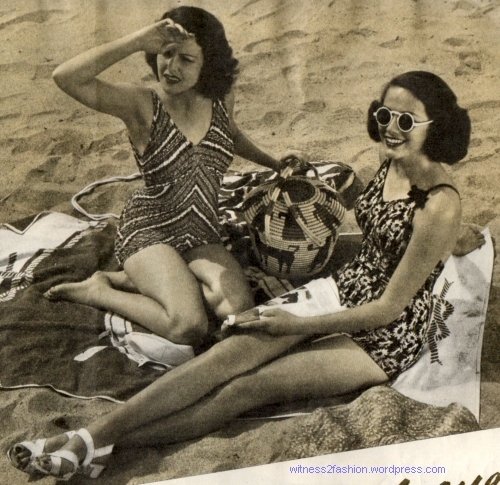 Striped and flowered bathing suits, July 1938. “Ordinary colored blown glass has wavy imperfections in it which distort the vision. . . . Science has perfected sunglasses that do not distort vision or darken the landscape. Even at a moderate price good sunglasses are now constructed so that they scientifically screen out most of the infra red and ultra violet rays. . . . Good sungogggles, not optically ground, of course, cost about fifty or seventy-five cents a pair, sometimes more. But the extra cost over the cheapest type is small compared to the comfort you get. Such glasses are usually a blue or green tint, they’re well made, and come in handy carrying cases.” — Hildegarde Fillmore, writing in McCall’s magazine, July 1938. How Do You Look in Your Bathing Suit? 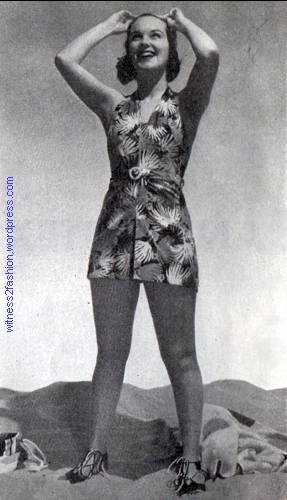 1938 halter-necked dressmaker bathing suit in “jungle print” with zipper front. 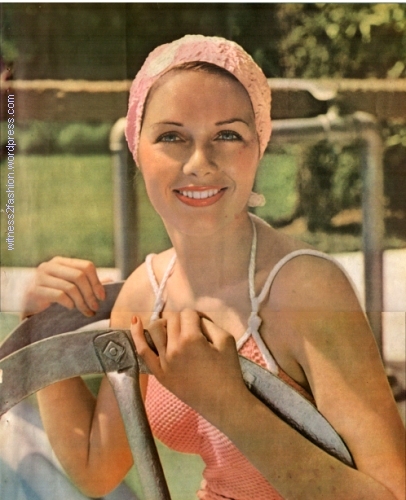 McCall’s, July 1938. 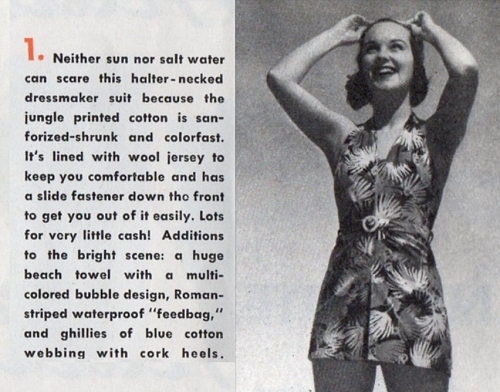 1938 bathing suit: “The brassiere gives a good uplift, and front and back panels do a flattening job.” McCall’s, July 1938. 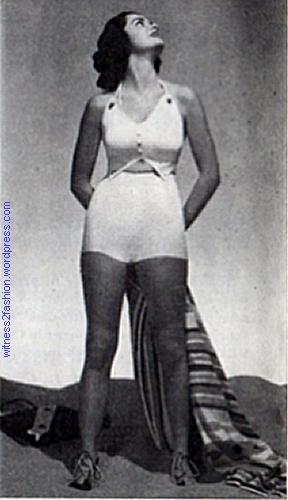 1938 white rubber bathing suit. McCall’s, July 1938. 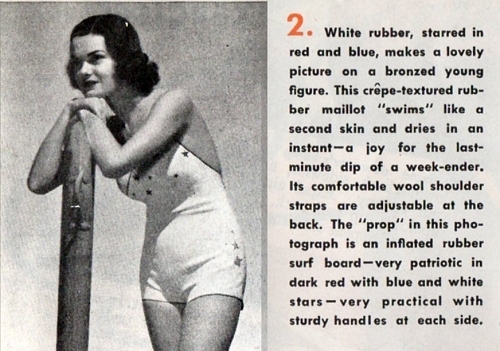 White textured rubber bathing suit “starred in red and blue”, McCall’s magazine, July 1938. 1938 ivory rubber bathing suit. McCall’s magazine, July 1938. I’m not sure how popular rubber bathing suits turned out to be, because, frankly, I didn’t want to do a search for them! Many years ago, while helping to organize a workshop on making dancewear, an online search for stretch fabrics taught me more than I really wanted to know about people who love spandex. Passionately. (Ahem.) I like to think that “nothing human is alien to me,” but I just don’t feel that curious about rubber clothing. However, given how hard it is to find vintage rubber swim caps in good condition, I doubt that many rubber bathing suits survived. 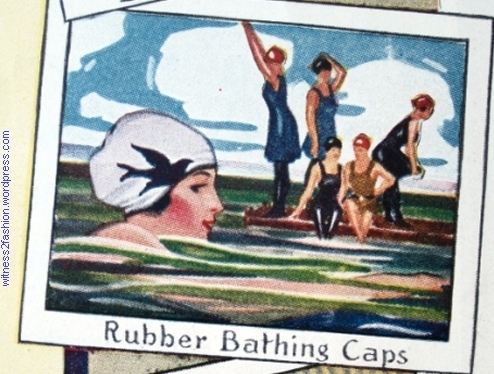 1917 bathing cap made by Faultless Rubber Co. Ad from Ladies’ Home Journal, Nov. 1917. A pretty cap like this would be quite a vintage collector’s item. Kleinert’s New “All-in-One” of Sturdi-flex rubber fabric is a perfect marvel!” Ad, 1937. “Kleinert’s Sturdi-flex Reducers are sized to bust measure. . . . It’s ODORLESS, perforated for coolness, and can be washed in a moment.” And only two dollars! The Perfolastic rubber reducing garments must have been more expensive, because their price was never given. Perfolastic rubber reducing garment advertisement from Woman’s Home Companion, March, 1937. 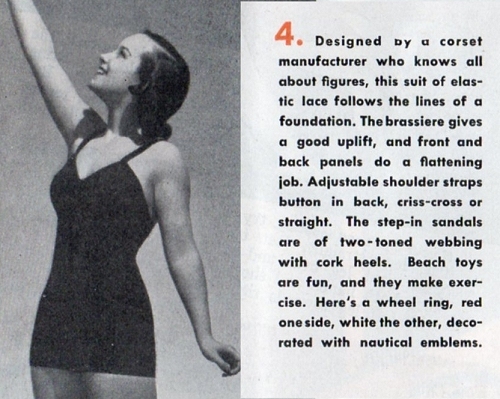 And Another Thing About 1930s Bathing Suits . . . I wasn’t expecting to see so many swimsuits with tight “boy-shorts” legs. 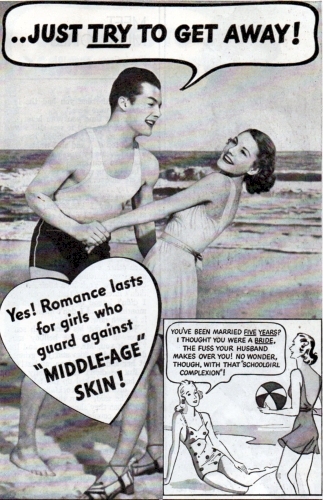 Late Thirties’ bathing suits are long, by modern standards. [No French cut legs on the beaches then!] 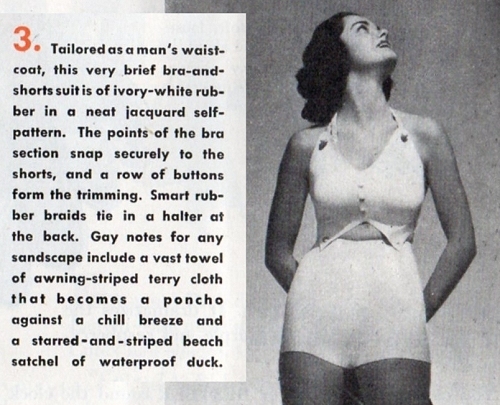 But even in the 1950’s, many women’s bathing suits still had a sort of “modesty panel” in front that concealed the crotch. 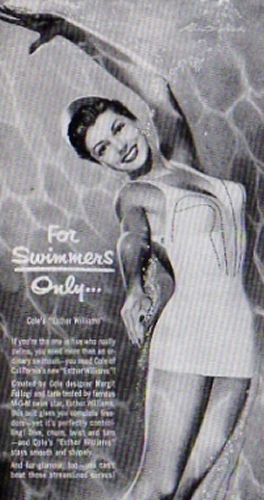 Esther Williams in an ad for Cole bathing suits, from her book, Million Dollar Mermaid. Here are some suits from the 1958 Sears catalog, two decades after the 1938 bathing suits pictured in McCall’s. 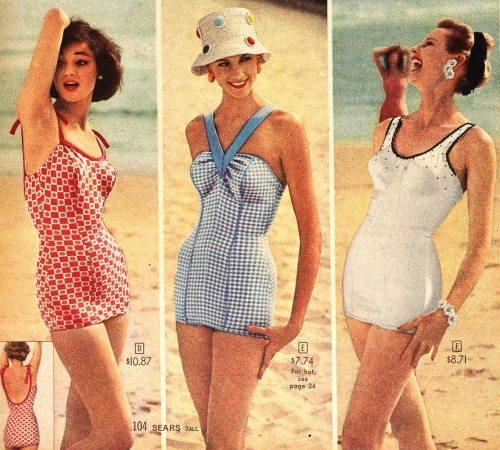 Sears’ catalog bathing suits for Spring 1958. They are still rather long, and all three have a modesty panel hiding the crotch area. 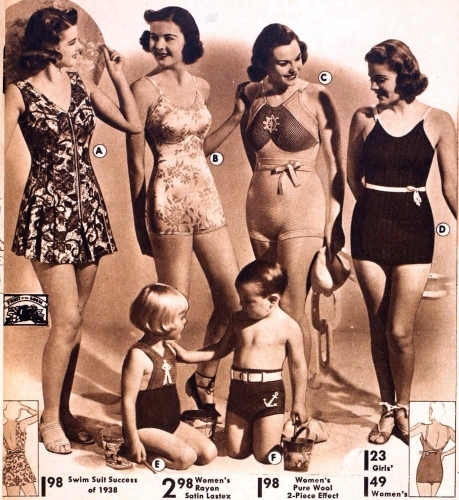 Bathing suits from Sears’ catalog for Spring 1938. 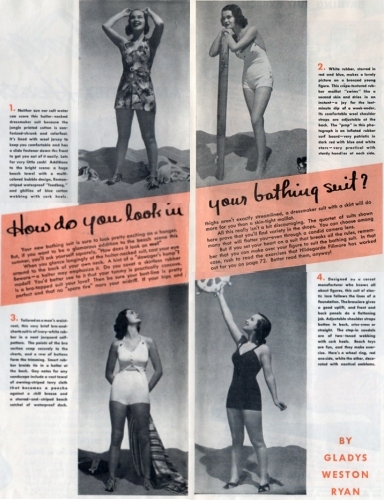 Bathing suits shown in ads in McCall’s are very similar to the conservative styles at the top of this post. 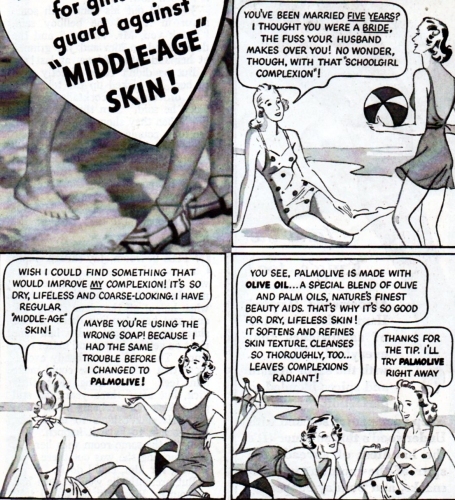 Swimsuits from an ad for Palmolive soap, McCall’s, July 1938. Skirted bathing suits with low backs and bra tops, from a Palmolive ad, McCall’s, July 1938. Note the attractively striped shoes, too. 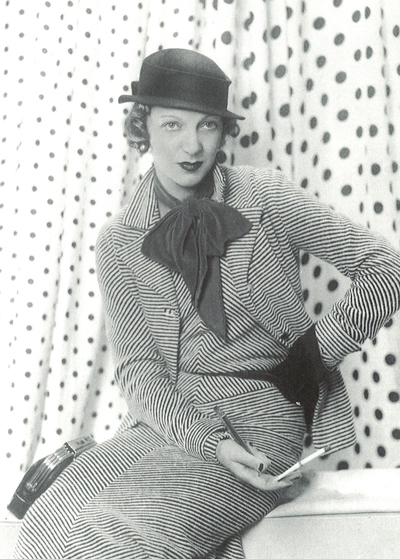 Fifty years ago, I saw this 1930’s photo of actress Gertrude Lawrence in a striped suit. The creative use of striped fabric struck me and stayed in my memory. 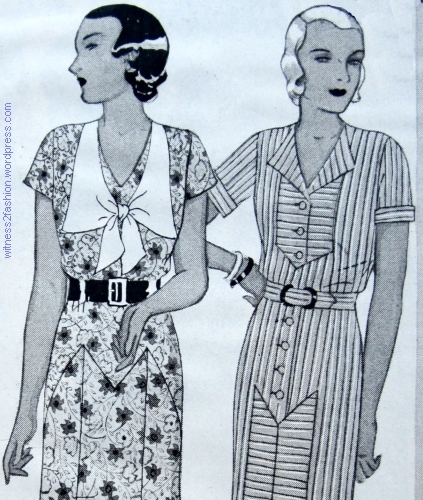 The joy of these nineteen thirties’ dresses is the way that a striped fabric is turned in different directions — horizontally, vertically, on the bias — to create the interest of the design. Butterick pattern after Jacques Heim, Butterick Fashion News, July 1939. Left: Stripes cut on the bias. 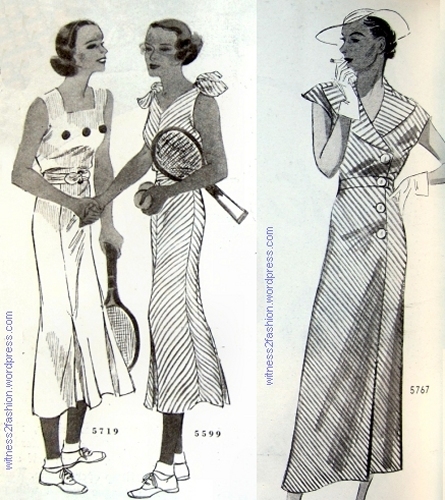 Butterick patterns from The Delineator, 1934. Left, #5599 from June. Right, #5767 from July. This fabric was probably printed with diagonal stripes and used on the straight grain. I’m trying to imagine jumping over the net in one of those tennis dresses. Actually, #5599 isn’t so simple; getting stripes to match and form chevrons on the bias takes patience. Striped dresses were usually summer wear. This one is punningly named after Lucky Strike Cigarettes. 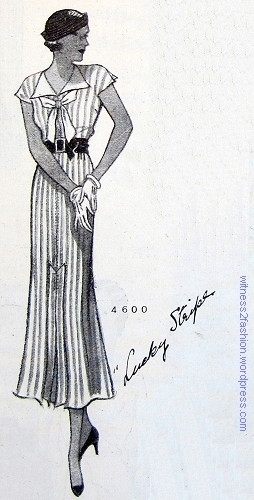 “Lucky Stripe;” Butterick pattern #4600 from June, 1932. The dress below is a three piece set: blouse (with or without sleeves) plus skirt and shorts. 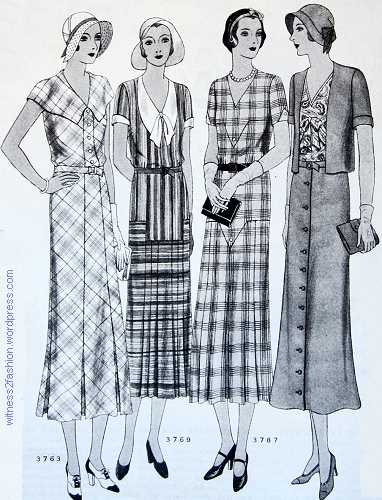 Butterick pattern #3785 from April, 1931. The stripes are all cut simply on straight of grain here, but pattern matching would make cutting and assembly more difficult! Matching stripes is a challenge for the dressmaker. The dresses that delight me turn the stripes in different directions. 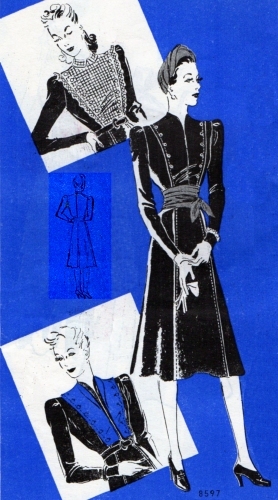 Pattern #8583 has a slenderizing center front panel, Butterick Fashion News, September 1939. It came in sizes 34 to 52. Sometimes the interest comes just from the flattering contrast between a horizontally striped yoke and a vertically striped dress. 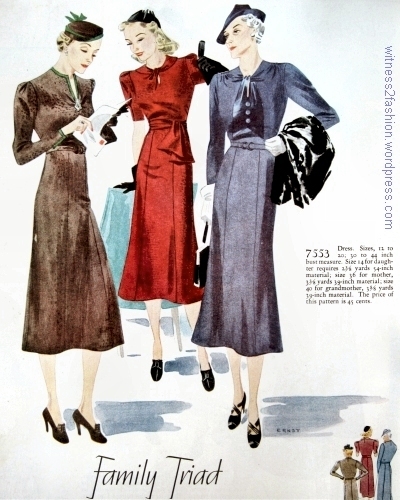 Far right, Butterick pattern #6622 in The Delineator, February 1936. 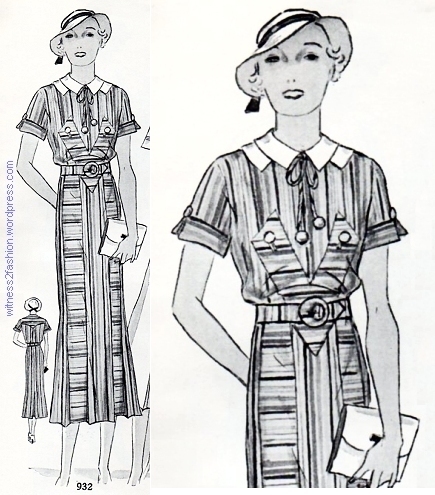 Butterick pattern #5201 makes a striped cruise dress, January 1934, The Delineator. The horizontally striped pocket flaps carry the yoke design to the skirt. 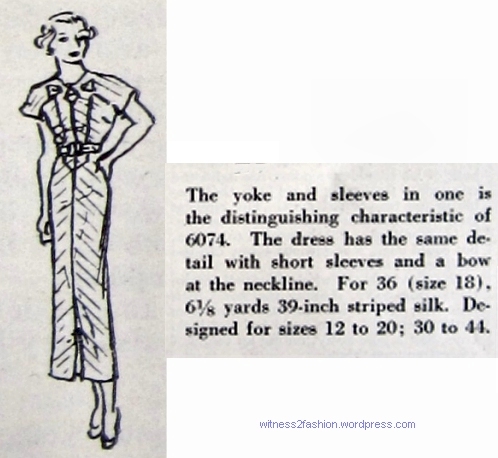 Bias cut yoke on #7743, Butterick Fashion News flyer, March 1938. 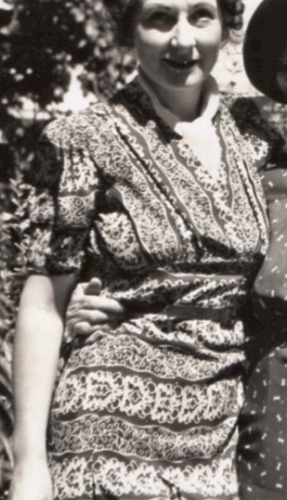 Horizontal stripes on yoke, pockets, and belt; vertical stripes on the body of the dress. Butterick Fashion News flyer, March 1938. 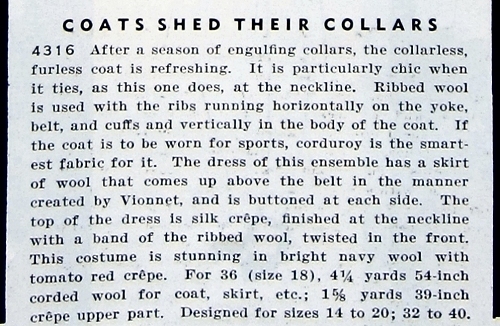 By 1938, the center front zipper was no longer news. This yoked dress and jacket combination (at right) has an interesting dress, too. 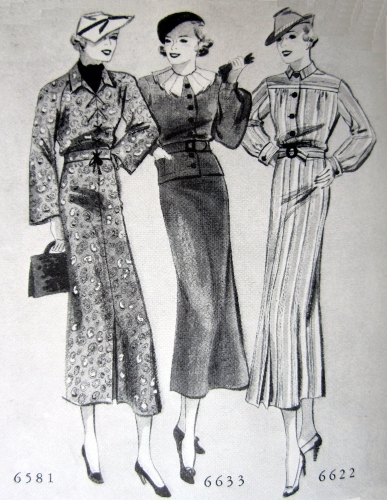 Jacket dresses from February, 1935. The bias stripes appear to change direction as they follow the sleeves. Butterick pattern #6074. This dress with chevroned stripes goes under coat # 6074 . 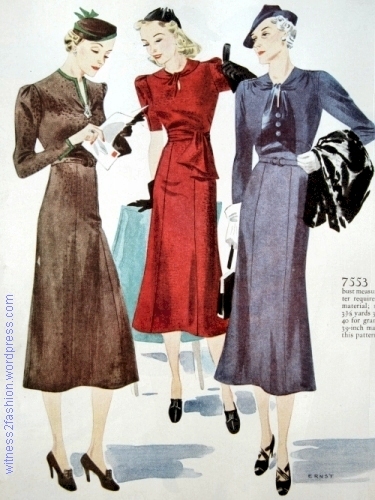 It also has “yoke and sleeves in one.” Butterick pattern from February 1935. The Delineator. 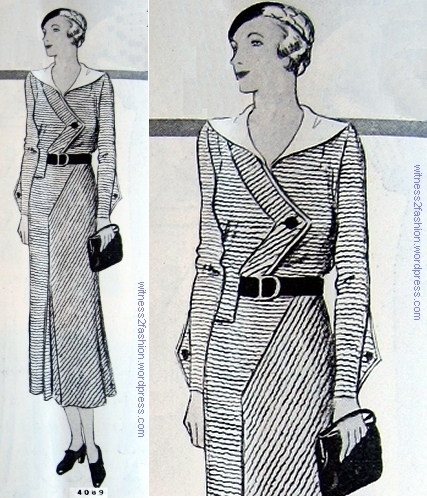 Striped jacket dress from May, 1934. Butterick #5634. Striped evening dress, Butterick, February 1934; striped gown and matching jacket, Butterick, July 1934. #5780 has beautiful, complex striped sleeves. But the play of stripes gets really interesting when used as the focus of the design. Berth Robert Semi-Made dress, Spring, 1934. 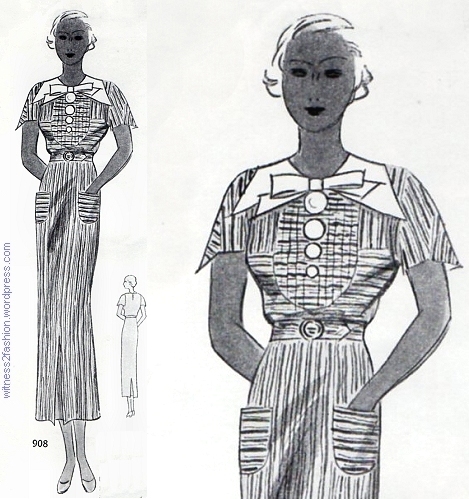 Butterick pattern #5678, May, 1934. The Delineator. 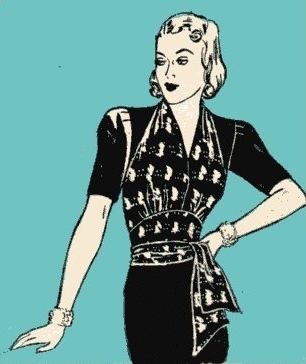 The more complex, the more fun — or at least, the more challenging for the dressmaker. 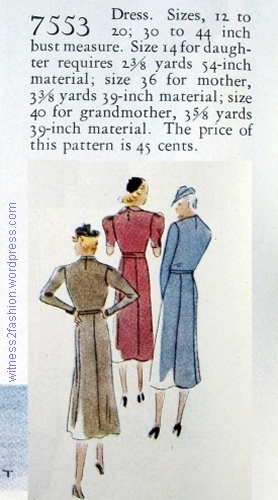 Butterick #4089, October, 1931. 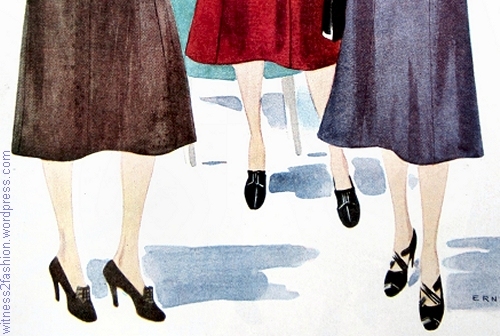 Illustration from Ladies’ Home Journal, Sept. 1936. “The zigzag dress to the left is made of muffler woolen, soft to touch, and in wonderful two-tone colorings. 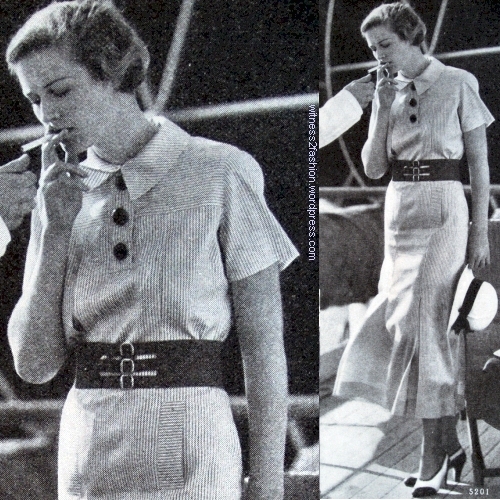 Leather belt and buttons, and a scarf barely peeking out above the collar.” — Ladies’ Home Journal, September, 1936. This one has contrasting shapes inserted in the sleeves, a tucked bib, and buttons in graduated sizes. Wearfast sports dress, Berth Robert Semi-Made dress catalog, Spring, 1934. 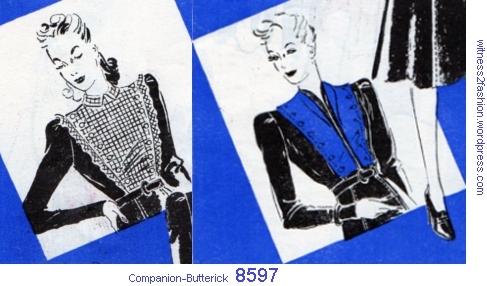 Butterick pattern #5760, May 1934, and Butterick #5822, August 1934. 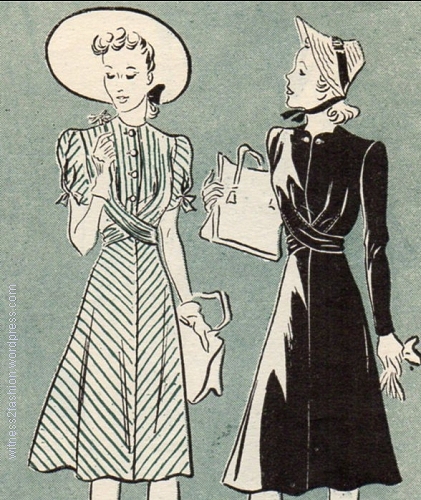 “Housedresses” from December, 1931. Butterick patterns. The one on the right was actually a “pull on” dress with mostly decorative buttons. Butterick Pattern #4316 for a dress with silk crepe bodice and skirt of ribbed wool, with matching coat. Contrast yoke, bow, cuff trim, and belt. The Delineator. February, 1932. 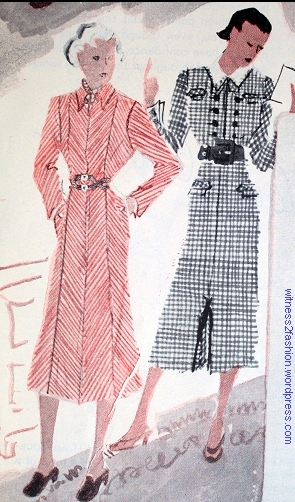 Corduroy coat, Butterick pattern #4290, January 1932. 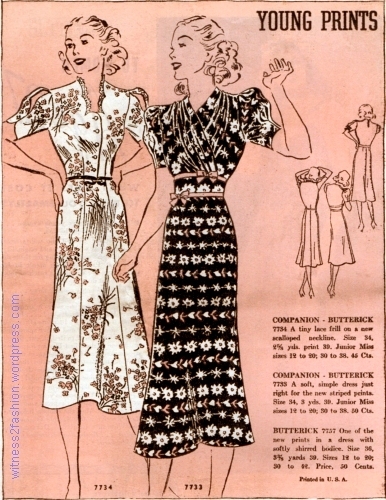 Butterick pattern #4530, May 1932. Berth Robert Semi-made dress #932, Spring 1934 catalog. 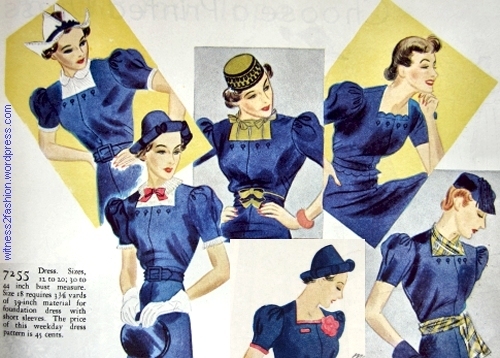 McCall’s pattern 9815, July 1938. 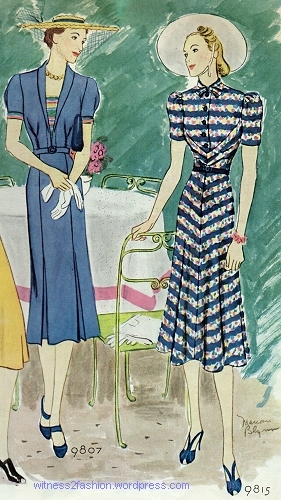 Floral stripes were popular in 1938. Resort dress, Butterick Fashion News flyer, July 1939. Butterick #8473. 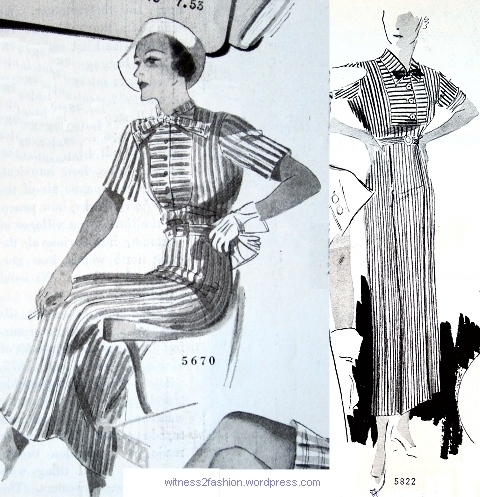 What a difference the stripes make: Two versions of Butterick #8557, Butterick Fashion News, September 1939. Companion -Butterick patterns Nos. 7734 and 7733, March 1938 Butterick Fashion News flyer. 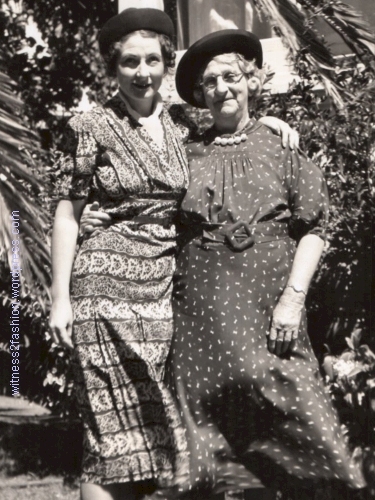 My mother with her mother, 1938. The woman on the left is in her 30s; the older woman is in her 60s. Of course, it’s not exactly the same dress, but it’s very similar. The photograph is dated 1938, and I happen to have several Butterick Fashion News flyers from 1938. 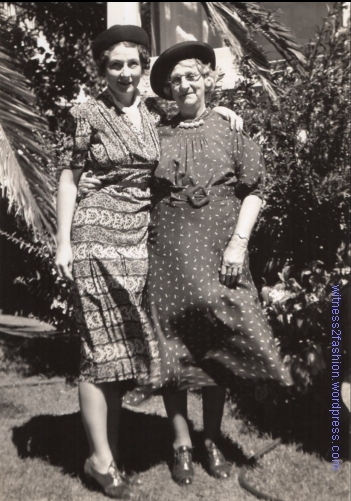 Large scale prints were becoming popular in women’s dresses, under the influence of Elsa Schiaparelli. 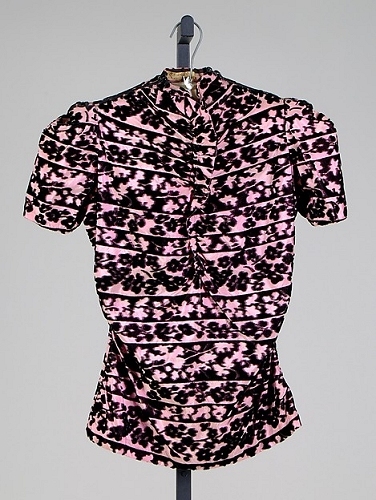 This Schiaparelli blouse, in the collection of the Metropolitan Museum, has a floral/horizontal striped print, too. 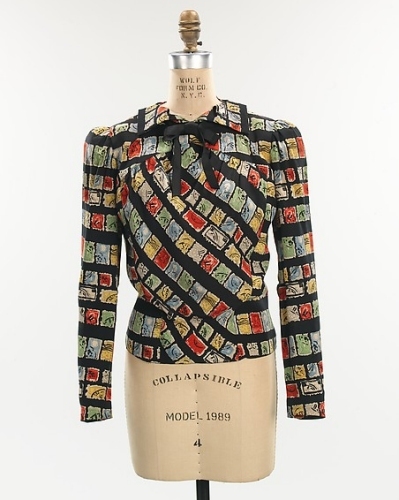 Schiaparelli print evening blouse, Metropolitan Museum. Winter 1938-1939. It has some elements in common with the dark fabric on the dress shown by Butterick, #7733. Companion-Butterick patterns Nos. 7734 and 7733, March 1938 Butterick Fashion News flyer. Companion -Butterick pattern No. 7745, Butterick Fashion News, March 1938. Companion-Butterick patterns 7781 (seated) and 7791, Butterick Fashion News , April 1938. 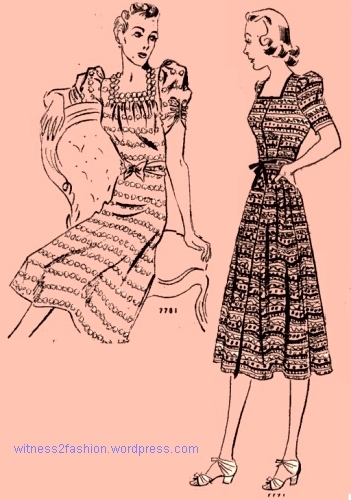 The dress on the left looks youthful, but the pattern goes to size 42″. 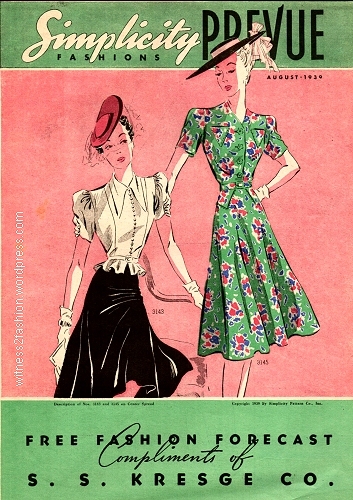 March 1938 cover of Butterick Fashion News, featuring Butterick pattern No. 7757. Companion-Butterick pattern 7626. Woman’s Home Companion, Nov. 1936. Schiaparelli blouse, summer of 1936; Metropolitan Museum collection. 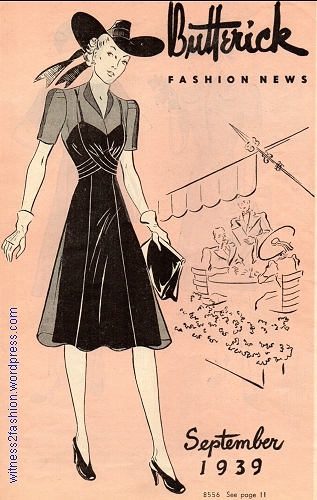 Butterick “Quick Change” accessory pattern 7792, Butterick Fashion News, April 1938. Taking a closer look at my mother’s dress from 1938, I can see that the pattern in the fabric is not actually floral; it is more like a negative pattern made by using lace to bleach out a solid color. 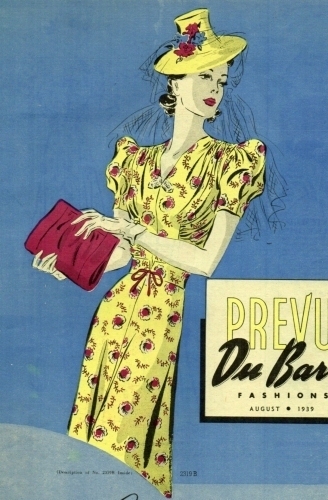 Close up of print dress, 1938. I can also see that there is a little white chemisette filling in the neckline. Note: Pictures from the Metropolitan Museum should not be copied from a blog and posted elsewhere — The Met graciously allows their use for writing about fashion history. If you want to use them, please get them from the Met’s Online Collection site, and credit the Museum. 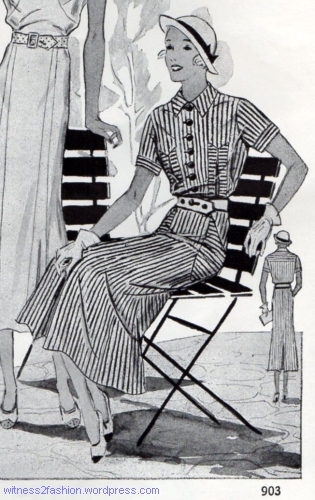 I confess that I am fascinated by the many “button-on” patterns I’m finding in 1930s magazines. They reflect a completely different way of thinking about clothes than we have today, in our “cheap and disposable” clothing culture. As a teenager, I lived in a house built in 1908; it had 12 foot ceilings and leaded glass windows in the china cabinet doors, but the bedroom closets — one to a room — were three feet wide and barely one coat hanger deep. I am sometimes appalled by the “House Hunters” who demand two walk-in closets. Does anyone really need that much stuff? 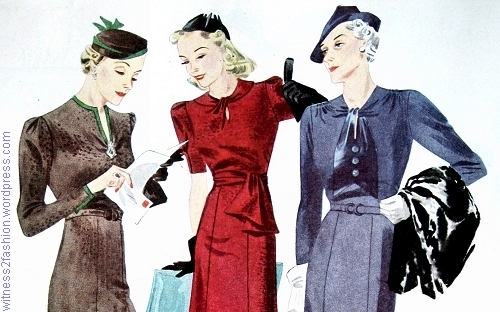 The average 1930s wardrobe for women would have fit in a very small closet. 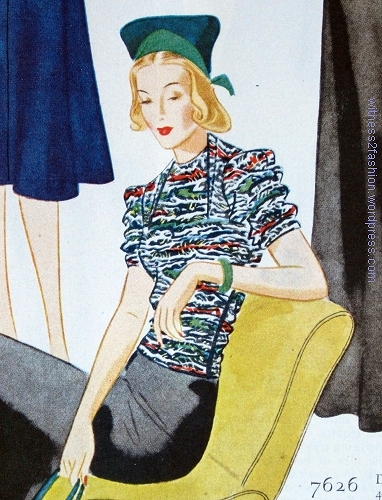 Companion-Butterick pattern 7255, Woman’s Home Companion, March 1937. Available in sizes 12 to 20 and bust 30 to 44;” this pattern cost 45 cents. There is a copy of this pattern in the Commercial Pattern Archive. The comment that you would need ony one pair of shoes for all six looks reminds us that, in the 1930s, most women had to pinch every penny. Click here for Living on $18 per Week, which explains that a college girl or office worker was expected to buy no more than four dresses and four pairs of shoes each year. I’d be curious to see the construction of this dress, since the last two views show that there has to be a fairly large opening between the yoke and the bodice. I’m guessing there was some sort of tab or underlap on the bodice section which held the single, large button which fastened through a buttonhole on the yoke. 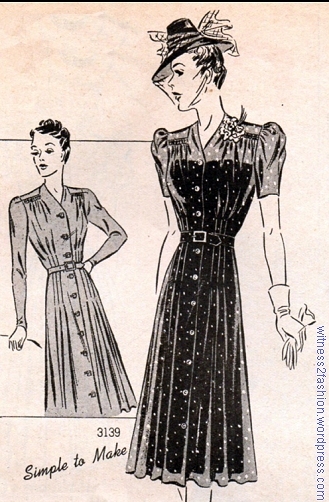 Companion-Butterick pattern 7579, Woman’s Home Companion, October 1937, was suggested for both secretaries’ and debutantes’ wardrobes. 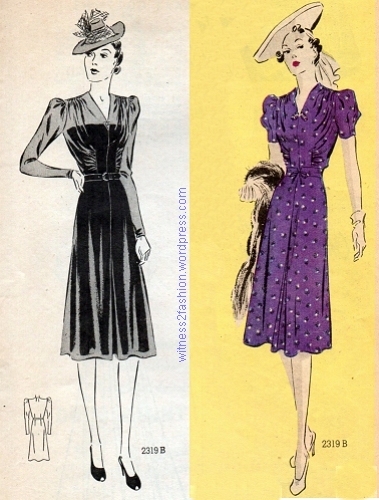 Companion-Butterick 8597, Butterick Fashion News, October 1939. All those buttons give a slightly military or western frontier look to pattern 8597. Butterick No. 5948, Butterick Fashion News flyer, December 1951. 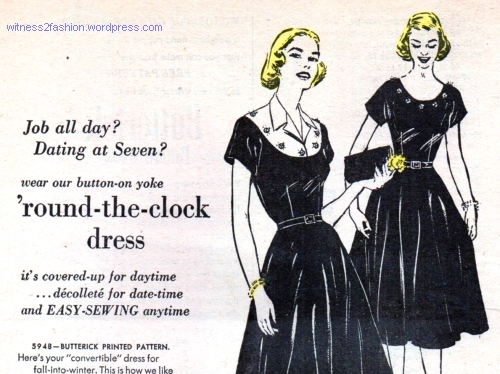 Butterick ‘Round the Clock dress pattern No. 5948, December 1951. Suggested fabrics were faille, crepe, corduroy, or velveteen. Available sizes 12 to 20 and up to bust size 38 inches. I can imagine this design also being popular with women who dressed up to play bridge one afternoon a week, or who couldn’t justify the expense of a rarely worn cocktail dress. Many faille or taffeta afternoon or “bridge” dresses turn up on vintage racks. Butterick No. 8556, Cover of Butterick Fashion News, September 1939. I bought some counter catalogs at an estate sale, and found, tucked inside, two copies of Prevue, a newsprint pattern flyer, for August 1939. One featured Du Barry patterns, and the other showed Simplicity patterns for the same month. 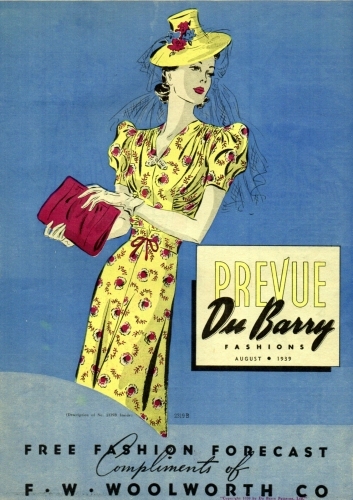 2 Du Barry Fashions Prevue, Cover, August 1939. Simplicity Fashions Prevue, Cover, August 1939. Du Barry Pattern 2319B made in lemon yellow print fabric. Love that hat! The belt is clever, too. Du Barry pattern #2319B as a sheer afternoon dress, and in purple print fabric. Du Barry #2319B, two versions. Aug. 1939. Simplicity pattern No. 3139, August 1939. In sizes 32 to 44. 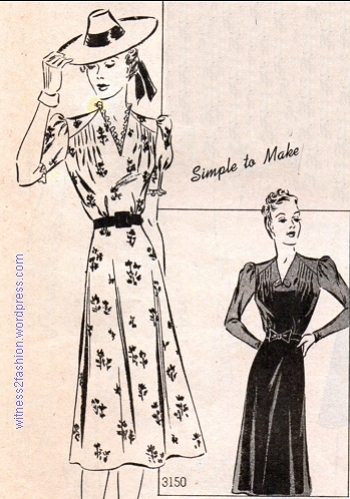 Simplicity pattern 3150, August 1939. In sizes 12, 14, 16, 18, 20, 40. 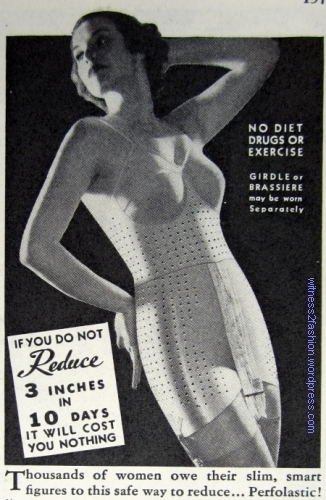 Patterns 3139 and 3150 were shown under the caption “Slenderizing Dresses.” Style 3139 came in sizes for bust 32″ to 44.” Style 3150 came in young women’s sizes 12 to 20; the largest bust measurement available was only 40 inches. However, sizes 12 to 20 were generally for a shorter woman than the sizes sold by bust measurement. Both patterns came with either long or short sleeves. Pattern 3139 is shown in a sheer print fabric, which might be either black or navy — the flyer doesn’t mention color. It has a slenderizing line of buttons down the front from neckline to hem. The other (3150) has that clever, slenderizing bow — not too wide — at the center of the waist, plus a V-neck. It’s amazing how sophisticated it looks without the ruffled trim. Companion-Butterick No. 8556, September 1939. 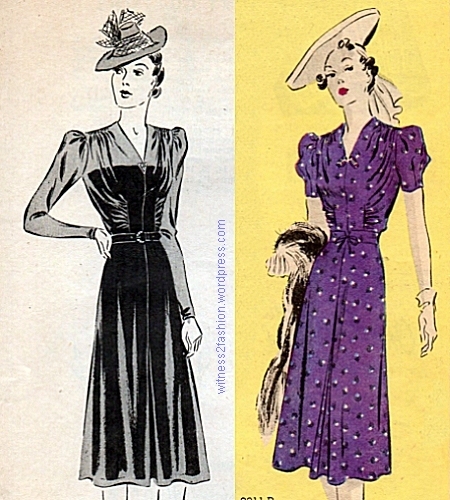 Butterick pattern 8557, Sept. 1939. Two views. Companion-Butterick # 8556 and Butterick 8557. Back views. Sept. 1939. 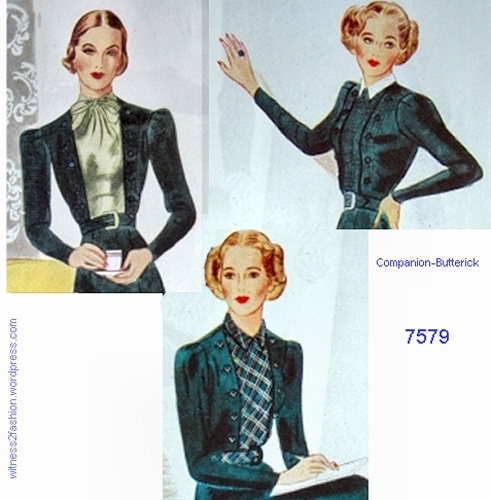 For more about Companion-Butterick patterns, click here. The daughter’s calot is a close-fitting cap without a brim. The styling of the bodices is varied, but, except for having shorter sleeves, the daughter’s version is not noticeably youthful. Grandmother’s heavy satin-backed silk is made with the matte side out and the shiny side used only as trim. It also has ruching on the shoulders, perhaps to provide a little more bust fullness, and less puffy sleeve caps. Mother’s wool-like brown silk bound in green grosgrain strikes me as a bit too “Robin Hood.” (To be fair, the Errol Flynn Adventures of Robin Hood wasn’t released until May of 1938.) 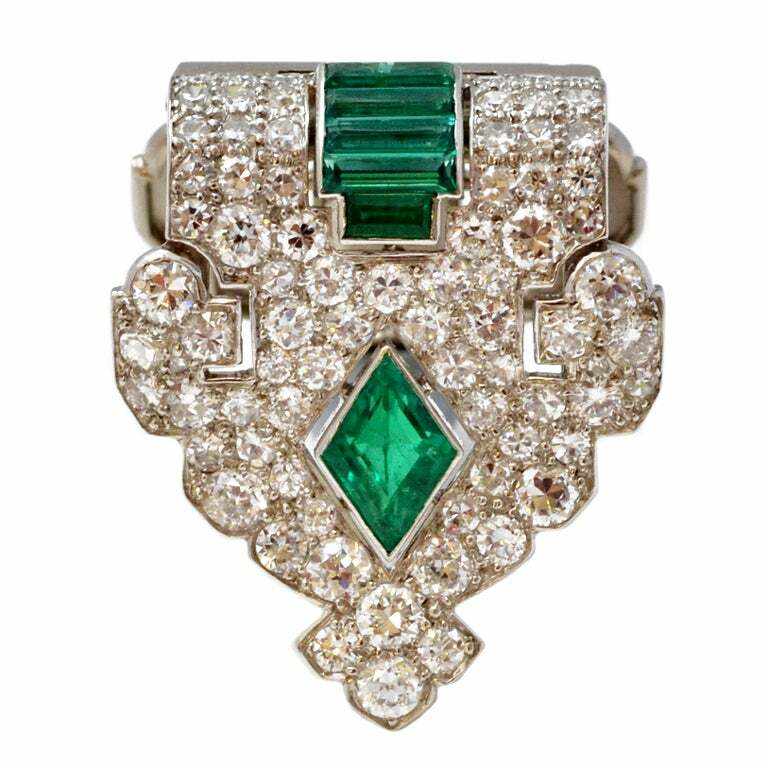 I’m hoping that’s a gorgeous Art Deco emerald clip on her neckline. To my eyes, the most youthful-looking shoes are worn by the grandmother, not the granddaughter. Notice how high and relatively narrow the heels on the “Fay” model are. Mother might also wear the “Stroller” heels, which are equally high, but not as thin. “Fernwood,” with a lower heel, looks more grandmotherly to me, and as recommended, they are suede or gabardine with patent leather trim. 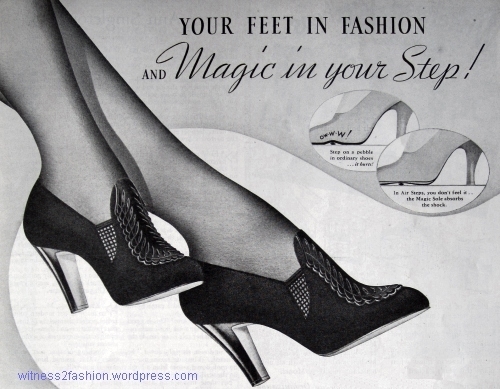 Perhaps the daughter is wearing “high-cut black suede pumps” with a zipper front, but these Air Step “Dianne” shoes would also do. 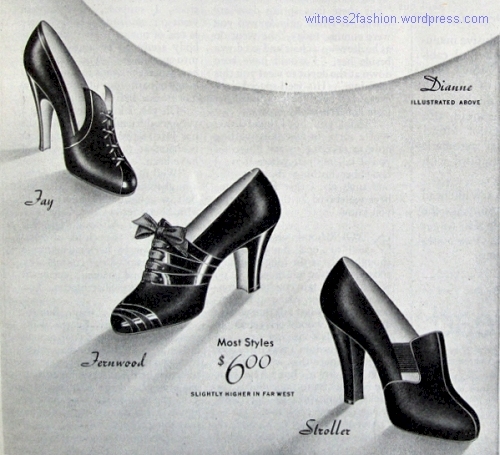 Air Step shoes, “Dianne” model, Sept. 1937. Woman’s Home Companion.